In physics, a spin network is a type of diagram which can be used to represent states and interactions between particles and fields in quantum mechanics. From a mathematical perspective, the diagrams are a concise way to represent multilinear functions and functions between representations of matrix groups. The diagrammatic notation often simplifies calculation because simple diagrams may be used to represent complicated functions. Roger Penrose is credited with the invention of spin networks in 1971, although similar diagrammatic techniques existed before his time. Spin networks have been applied to the theory of quantum gravity by Carlo Rovelli, Lee Smolin, Jorge Pullin, Rodolfo Gambini and others. Spin networks can also be used to construct a particular functional on the space of connections which is invariant under local gauge transformations. A spin network, as described in Penrose (1971), is a kind of diagram in which each line segment represents the world line of a "unit" (either an elementary particle or a compound system of particles). Three line segments join at each vertex. A vertex may be interpreted as an event in which either a single unit splits into two or two units collide and join into a single unit. 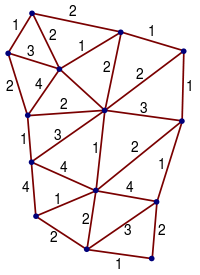 Diagrams whose line segments are all joined at vertices are called closed spin networks. Time may be viewed as going in one direction, such as from the bottom to the top of the diagram, but for closed spin networks the direction of time is irrelevant to calculations. Each line segment is labelled with an integer called a spin number. A unit with spin number n is called an n-unit and has angular momentum nħ/2, where ħ is the reduced Planck constant. For bosons, such as photons and gluons, n is an even number. For fermions, such as electrons and quarks, n is odd. Triangle inequality: a must be less than or equal to b + c, b less than or equal to a + c, and c less than or equal to a + b.
Fermion conservation: a + b + c must be an even number. For example, a = 3, b = 4, c = 6 is impossible since 3 + 4 + 6 = 13 is odd, and a = 3, b = 4, c = 9 is impossible since 9 > 3 + 4. However, a = 3, b = 4, c = 5 is possible since 3 + 4 + 5 = 12 is even, and the triangle inequality is satisfied. Some conventions use labellings by half-integers, with the condition that the sum a + b + c must be a whole number. More formally, a spin network is a (directed) graph whose edges are associated with irreducible representations of a compact Lie group and whose vertices are associated with intertwiners of the edge representations adjacent to it. A spin network, immersed into a manifold, can be used to define a functional on the space of connections on this manifold. One computes holonomies of the connection along every link (closed path) of the graph, determines representation matrices corresponding to every link, multiplies all matrices and intertwiners together, and contracts indices in a prescribed way. A remarkable feature of the resulting functional is that it is invariant under local gauge transformations. In loop quantum gravity (LQG), a spin network represents a "quantum state" of the gravitational field on a 3-dimensional hypersurface. The set of all possible spin networks (or, more accurately, "s-knots" – that is, equivalence classes of spin networks under diffeomorphisms) is countable; it constitutes a basis of LQG Hilbert space. ji = 0, 1/2, 1, 3/2, ... is the spin associated with the link i of the spin network. The two-dimensional area is therefore "concentrated" in the intersections with the spin network. According to this formula, the lowest possible non-zero eigenvalue of the area operator corresponds to a link that carries spin 1/2 representation. Assuming an Immirzi parameter on the order of 1, this gives the smallest possible measurable area of ~10−66 cm2. The formula for area eigenvalues becomes somewhat more complicated if the surface is allowed to pass through the vertices, as with anomalous diffusion models. Also, the eigenvalues of the area operator A are constrained by ladder symmetry. Similar quantization applies to the volume operator. The volume of 3D submanifold that contains part of spin network is given by a sum of contributions from each node inside it. One can think that every node in a spin network is an elementary "quantum of volume" and every link is a "quantum of area" surrounding this volume. Similar constructions can be made for general gauge theories with a compact Lie group G and a connection form. This is actually an exact duality over a lattice. Over a manifold however, assumptions like diffeomorphism invariance are needed to make the duality exact (smearing Wilson loops is tricky). Later, it was generalized by Robert Oeckl to representations of quantum groups in 2 and 3 dimensions using the Tannaka–Krein duality. Michael A. Levin and Xiao-Gang Wen have also defined string-nets using tensor categories that are objects very similar to spin networks. However the exact connection with spin networks is not clear yet. String-net condensation produces topologically ordered states in condensed matter. In mathematics, spin networks have been used to study skein modules and character varieties, which correspond to spaces of connections. Wikimedia Commons has media related to Spin networks. ^ a b R. Penrose (1971a), "Angular momentum: an approach to combinatorial spacetime," in T. Bastin (ed. ), Quantum Theory and Beyond, Cambridge University Press (this paper can be found online on John C. Baez's website); and R. Penrose (1971b), "Applications of negative dimensional tensors," in D. J. A. Welsh (ed. ), Combinatorial Mathematics and its Applications (Proc. Conf., Oxford, 1969), Academic Press, pp. 221–244, esp. p. 241 (the latter paper was presented in 1969 but published in 1971 according to Roger Penrose, "On the Origins of Twistor Theory" in: Gravitation and Geometry, a Volume in Honour of I. Robinson, Biblipolis, Naples 1987). Kogut, John; Susskind, Leonard (1975). "Hamiltonian formulation of Wilson's lattice gauge theories". Physical Review D. 11 (2): 395–408. Bibcode:1975PhRvD..11..395K. doi:10.1103/PhysRevD.11.395. Rovelli, Carlo; Smolin, Lee (1995). "Spin networks and quantum gravity". Phys. Rev. D. 52 (10): 5743–5759. arXiv:gr-qc/9505006. Bibcode:1995PhRvD..52.5743R. doi:10.1103/PhysRevD.52.5743. Pfeiffer, Hendryk; Oeckl, Robert (2002). "The dual of non-Abelian Lattice Gauge Theory". Nuclear Physics B - Proceedings Supplements. 106-107: 1010–1012. arXiv:hep-lat/0110034. Bibcode:2002NuPhS.106.1010P. doi:10.1016/S0920-5632(01)01913-2. Pfeiffer, Hendryk (2003). "Exact duality transformations for sigma models and gauge theories". Journal of Mathematical Physics. 44 (7): 2891–2938. arXiv:hep-lat/0205013. Bibcode:2003JMP....44.2891P. doi:10.1063/1.1580071. Oeckl, Robert (2003). "Generalized lattice gauge theory, spin foams and state sum invariants". Journal of Geometry and Physics. 46 (3–4): 308–354. arXiv:hep-th/0110259. Bibcode:2003JGP....46..308O. doi:10.1016/S0393-0440(02)00148-1. Baez, John C. (1996). "Spin Networks in Gauge Theory". Advances in Mathematics. 117 (2): 253–272. doi:10.1006/aima.1996.0012. Major, Seth A. (1999). "A spin network primer". American Journal of Physics. 67 (11): 972–980. arXiv:gr-qc/9905020. Bibcode:1999AmJPh..67..972M. doi:10.1119/1.19175. G. E. Stedman, Diagram Techniques in Group Theory, Cambridge University Press, 1990. Predrag Cvitanović, Group Theory: Birdtracks, Lie's, and Exceptional Groups, Princeton University Press, 2008.